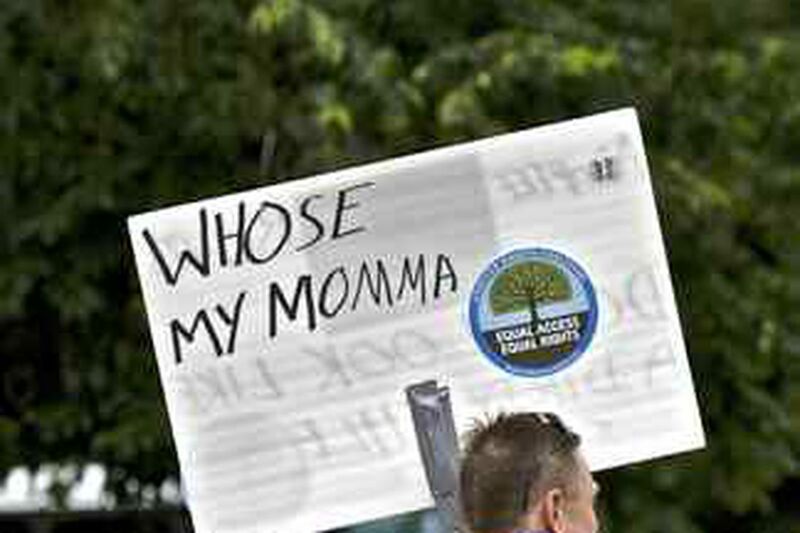 Protesters near Independence Hall yesterday objected to laws denying adoptees access to original birth certificates. "There's no sane reason for us not to have the information," one said. B7. Let adult adoptees have their original birth certificates. It's not as simple as it sounds. Those records are sealed in 44 states, including Pennsylvania and New Jersey. And for Benoit, pushing legislative colleagues toward change has been difficult. "They're oftentimes open-minded and will listen," she said. "But if there's not enough people in their constituency, they won't support it because there's nothing in it for them." Yesterday, Benoit, herself adopted, staffed a booth for the Adoptee Rights Coalition, among the groups pressing their causes to the National Conference of State Legislatures, which is holding its annual meeting at the Convention Center. Benoit, a Republican, now works as executive director of Maine-based Adoptee CARE, the Adoptee Council for Adoption Reform Education, which means traveling to events like the one in Philadelphia. Outside the hall yesterday, about 120 adoptees and birth parents from as far as England staged a loud, sign-waving demonstration. They marched to the Convention Center from People's Plaza, near Independence Hall, ignoring the rain, helped by police who stopped traffic at Market Street crossroads. "You got yours . . ." came the call from protest organizers. "I want mine!" shouted the marchers. Tourists and pedestrians, confused or amused, stood aside to let them pass. "You deserve your rights!" one bystander shouted at the group, adding, "My cousin's adopted." In the United States, laws passed in the 1930s and 1940s created "amended birth certificates" that replaced the names of biological parents with those of adoptive parents. Adoption was considered shameful, and experts favored permanent separation between birth parents and children. Today it's common for birth parents, adoptive parents, and children to be in contact. But only Alaska, Oregon, Kansas, Alabama, New Hampshire, and Maine allow adult adoptees to have unrestricted access to their original birth records. And the battle over access ranks among the most controversial issues in the field. The National Council for Adoption, a well-known advocacy and policy group, staunchly opposes open records, saying that birth mothers who were promised privacy deserve to keep it. State chapters of Planned Parenthood and the ACLU are opposed, as are Catholic organizations. None of those groups were present yesterday - nor did they need to be. They're winning the argument, noted adoptee Dan Haines of Egg Harbor. That forces adoptees to mount a state-by-state appeal to lawmakers that could go on forever. And while that happens, he said, birth parents grow old and die. That fact lends urgency to what adoptees call the nation's last civil-rights battle. "There's no sane reason for us not to have the information," said Heather Holmes, an adoptee who was born in New York and raised in England. On Monday, she met her biological mother for the first time, at Philadelphia International Airport. They've corresponded for several years, connecting after each searched for the other. "Whatever relationship adults want to have, it's not the government's business," Holmes said in a crisp English accent. "It's a major Big Brother thing," added her mother, Carole Baker, of Orlando, Fla. The nation's newest open-records law took effect Jan. 2 in Maine. Benoit, defeated for reelection, went immediately to get her birth certificate. She discovered she was one of nine siblings - and that two Maine state legislators were her nephews. Her work for Adoptee CARE often involves telling her story, explaining to legislators that adoptees can't get their birth records. "Half of them don't even know," she said. "They say, 'I have adopted nieces and nephews, and they can't get their original birth certificates?' "